Enerfood – A Nutrient Dense Green Drink Recipe! Enerfood, made by Enerhealth Botanicals, is a blend of powdered nutrient dense ingredients. Discover how to blend this green drink recipe into delicious breakfast smoothie recipes. Boost your morning with this superfood in your low calorie smoothie recipes! If you research all the green drinks available in the market, you will find a lot of fluff ingredients or cheap fillers, like flax seed or apple pectin, in the different green drinks. Fluff fillers do not have anything to do with Enerfood. Enerfood's ingredient list was carefully chosen to provide only the best. I have spent many hours of research online, talked to different supplement companies, and tasted many different green drinks. 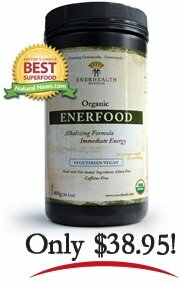 Enerfood is one of my top choices for nutrient dense green drinks. The low price, organic ingredients, and the convenience make it stand out from the all other green drink mixes. Where most green drinks come in one month containers, Enerfood provides almost 2 months of nutrient dense powder. Not only do you get more product, you also receive more condense greens. In many green drinks they only contain 3 grams of greens in each serving. In a 8 gram serving of Enerfood you get more greens! Enerhealth Botanicals formulate their products to best benefit you. They added every ingredient in Enerfood for a reason. √ 2 year life span – Are you ever concerned about not having enough nutrition your family during an emergency? A green drink is a perfect lightweight powder to carry with you? Spirulina, Chlorella, Non-active, Vegetarian, Saccharomyces Cervisiae Nutritional Yeast, Dulse, Kelp, Barley Grass, Wheat Grass, Alfalfa Leaf, Spinach, Rose Hips, Beet Root, Orange Peel, Winter Cherry Root, White Asparagus Root, Dandelion Leaf, Lemon Peel, Papaya Leaf, Horsetail, and Barley & Wheat Grass Juice Powder. The only thing that I didn’t like about Enerfood is that it has a grassy, fishy flavor. Keep in mind that the more greens you have the grassier the green drink will taste. Since this green drink recipe isn’t filled with sweeteners, natural flavors, and other fillers, you will get a stronger tasting drink. Have you tried a strong green drink stirred in water? Did you swear never to subject your taste buds to that grassy-swap water ever again? Well... I’ve been there and done that! I am not a fan of plugging my nose while gagging down a green drink. That is why I have created several different yummy Enerfood smoothie recipes to hid those grassy green drinks. Try them and see that even your kids will drink it!. $38.95 + 8.95 Flat Rate USA Shipping! I purchase small quantities at a time so that you receive the freshest and most up-to-date product for the price! Flat rate shipping prices are only for USA addresses. Please contact me for shipping prices on out of the country addresses. These statements have not been evaluated by the Food and Drug Administration and are not intended to diagnose, treat, cure or prevent any disease. Consult your physician before beginning any diet, nutrition, exercise or dietary supplement program.